By bringing art outside the traditional context of museums and galleries, Public Art Indianapolis benefits the community and its visitors by increasing access to art, extending our cultural institutions' reach beyond their campuses, and providing artists with opportunities to expand their artistic practice and market. The program has a commitment to work with both emerging and established artists, galleries, and museums to produce high quality, innovative, and creative art projects and exhibitions in public spaces in Indianapolis. In 2004 the Arts Council of Indianapolis, with the support of the Indianapolis Cultural Development Commission and Mayor Bart Peterson's office, launched the Public Art Indianapolis program. 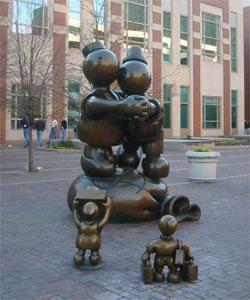 After taking part in establishing a database of artists working in Central Indiana and a weekly e-blast to those artists publishing opportunities on the local, regional, and national level, the program simultaneously organized and produced Tom Otterness in Indianapolis, a six month public exhibition of 25 bronze sculptures by Tom Otterness as well as the Great Ideas Competition for artists working in the state of Indiana. September 2006 marked the opening of Julian Opie: Signs, the British artist's largest public project to date that brought 11 art installations to the city: six pre-existing projects and five new commissions. In addition, the program produces projects by artists living in Indiana though the Picture Windows: Urban Interpretations program that turns over vacant street-level window spaces to artist, as well as a partnership to bring written and spoken word projects to users of public transportation. In late 2006, the Arts Council was contracted to manage a $2 million budget and provide public art curatorial and project management on the Indianapolis Cultural Trail, a dedicated bike and pedestrian pathway being built in downtown Indianapolis from 2007 through 2010. Historically, art that is accessible to the public has been in the form of freestanding pieces of work or objects that occupy a public space, such as sculptures or memorials, or architectural embellishments such as carved facades. 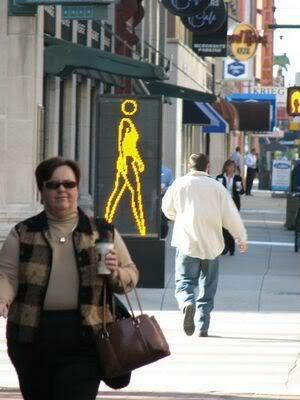 Art may also be integrated into the way the city is built. Functional objects such as benches, trail markers, tree guards, or manhole covers can be commissioned works by artists. And now, in a growing number of cities, artists are working with architects, engineers, and landscape designers to create visually rich public spaces. These include pedestrian and vehicular bridges, streetscapes, and canal banks. All of these forms of public art make cities more interesting and unique places to live, work, and visit. By bringing art outside the traditional context of museums and galleries, Public Art Indianapolis will benefit the community and its visitors by supporting projects that are increasing access to art, extending our cultural institutions' reach beyond their campuses, and providing artists with opportunities to expand their artistic practice and market. Our commitment is to work with both emerging and established artists, galleries, museums, and other arts institutions to produce high quality, innovative, and creative displays of art throughout Indianapolis. Perhaps the first art exhibit to grace Indiana would be the LOVE pop art sculpture by Robert Indiana. LOVE is a pop art sculpture by Robert Indiana. Physically the sculpture consists of the large letters LO, with the O canted sideways, over the letters VE. The letters are red on their faces and blue on their sides. Robert Indianas Love image takes sculptural form in numerous locations around the world, from New York's Sixth Avenue to Taipei 101; the icon represents the centerpiece of LOVE Park in Philadelphia, Pennsylvania. Originally a design for a Christmas card in 1964, and first exhibited as a sculpture in New York in 1966, the image has been reproduced and parodied in posters, pictures, jewelry, and greeting cards. Indiana has created several variants as paintings and screenprints The original Love outside sculpture, created in 1970 of cor-ten steel, stands in the sculpture garden at the Indianapolis Museum of Art. The Indianapolis Cultural Development Commission, the Arts Council of Indianapolis, the Deborah Joy Simon Charitable Trust and Marlborough Gallery are pleased to announce Tom Otterness in Indianapolis, an exhibition of 25 sculptures by New York sculptor Tom Otterness. Indianapolis is the only city besides New York to host the exhibition. His stylized bronze figures combine into sculptural ensembles that explore the range of human experience, from grand ambition to common foibles, plucking imagery and themes from popular culture and subtly transforming them into humorous commentary. Maribeth Smith began an effort to raise money to purchase some of the pieces for the city. The American Association of Museums conference brought 5,000 museum directors for 32 countries here. "They loved the sculptures and gave Indianapolis credit for being culturally sophisticated. Myrta and Maribeth thought that it was a shame that the sculptures would eventually go away, and decided they would do thier best to keep at least these three pieces in Indianapolis for people to enjoy. "Walking Fish": Beside the Downtown Canal, in the tiered limestone garden between the Eiteljorg and Indiana State museum. 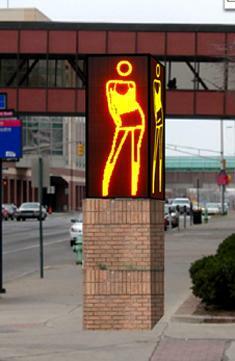 The Otterness exhibition was followed by a second citywide public art installation, Julian Opie: Signs, which featured 11 installations, including three LED sculptures - one of a man and one of a woman walking, and one of a woman dancing. Mindy Taylor Ross, director of the Arts Council's Public Art Indianapolis program, who led both the Otterness and Opie exhibits, is now finalizing plans for a third public art exhibition. 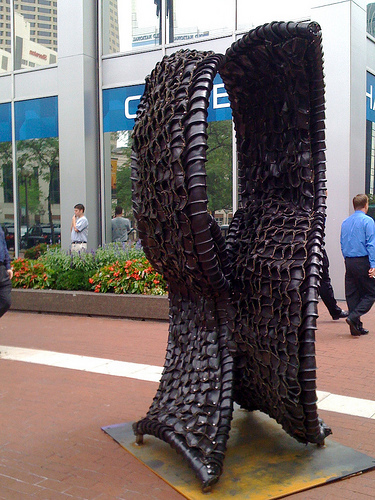 Officials are in contract negotiations with Chakaia Booker, a New York City-based female African-American sculptor whose lushly expressive work is made from found and reused materials including vulcanized rubber woven into towering pieces of art. Bird is on view outside 752 Massachusetts Ave.
Born in 1958, Darlene Delbecq is one half of an identical set of twins, a fact that is central to her life and art. Delbecq's photographs often contain the suggestion, if not the reality, of double and sometimes mirror images. In Bird, slang for young woman, duality is the leitmotif. Two large lenses of the binoculars, echoed by two tiny nostrils, stare out at the viewer. Two gloved hands rise out of a mélange of feathers. Hidden behind this assemblage are two eyes, windows to the soul, trained on the viewer. In a twist on perception, the observer becomes the observed. Delbecq attended the Herron School of Art and has maintained a studio in downtown Indianapolis for nearly 25 years. 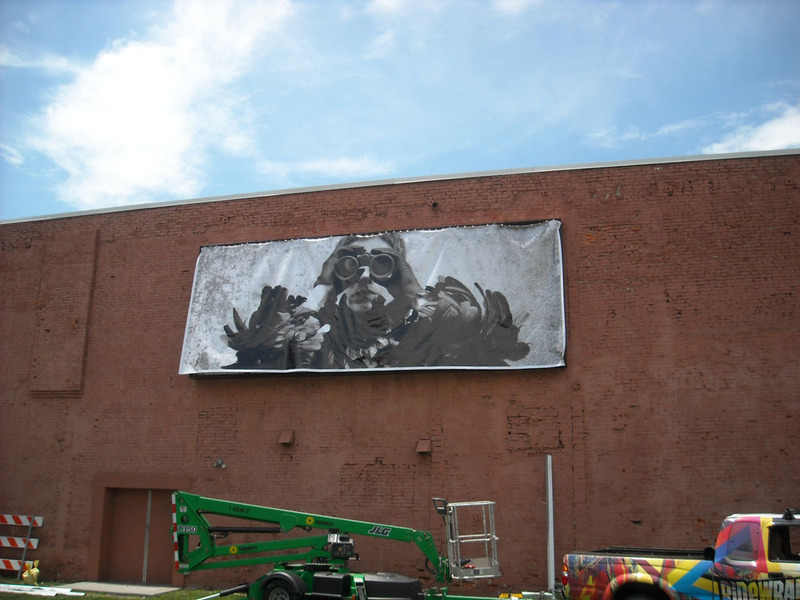 This public art project was made possible through the support of an anonymous private donation and the Indianapolis Cultural Development Commission. It is dedicated to Greg Charleston for his years of service to the arts community in Indiana. This major and permanent public art sculpture titled "The Tent" is the Festival's gift to the community and pays tribute to community and volunteer spirit during the Festival's first 50 impactful years. The art piece was created by internationally renowned artist Donald Lipski. Lipski was chosen by the 500 Festival's 50th Anniversary Artist Selection Committee, which was organized by the 500 Festival, with support from the Arts Council of Indianapolis and is comprised of representatives from the 500 Festival, the 500 Festival Foundation as well as representatives from the Indianapolis Museum of Contemporary Art, Eiteljorg Museum of American Indians and Western Art, Herron School of Art and Design, Expo Design and the Indianapolis Motor Speedway. The Tent stands 43' tall and 14' wide. The Tent is a wind activated sculpture and was built from tubular stainless steel. 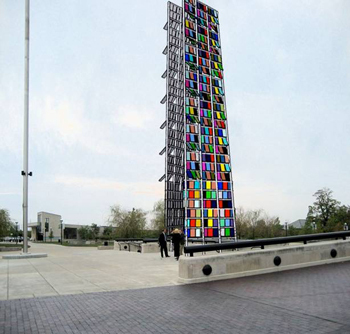 It has nearly 500 panels of polished stainless steel and is painted on the outside with 23 bright colors. 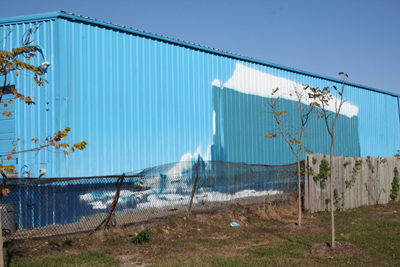 "Iceberg" is a mural located at 2301 Winthrop Avenue on the side of the Stone and Rhodes Trucking service garage, and can be viewed while traveling along the Monon Trail Greenway. "Picture Windows: Urban Interpretations" was developed by Public Art Indianapolis, a program managed by the Arts Council of Indianapolis and funded by the Indianapolis Cultural Development Commission. Its intent is to bring locally created artwork to high traffic or transitional areas by commissioning artists to produce site-specific work for each window. Originally created to enliven empty windows and buildings, the project was designed to contribute to the vitality of downtown Indianapolis while exposing visitors and citizens to the diverse work of local artists. The project's initial five windows debuted in 2005 after meeting with immediate support from building owners John Demaree and William Ehret, Uptown Realty Investors LLC (14 E. Washington St.) and Chase Tower Garage, 120 N. Pennsylvania Street. "Iceberg" is a mural located at 2301 Winthrop Avenue on the side of the Stone and Rhodes Trucking service garage, and can be viewed while traveling along the Monon Trail Greenway. The entire corrugated steel building was power-washed, primed, and sprayed with a gloss exterior latex paint. This mural depicts a large block of glacial ice melting out at sea, intended to serve as a reminder of the impact our human activities have on the global environment. Jeff Martin is the president and founding board member of Primary Colours, a non-profit organization devoted to integrating visual artists and the community to sustain a thriving environment for the arts. Martin also received a Creative Renewal Fellowship from the Arts Council of Indianapolis in 2005. "Urban Silos sprung from childhood memories of lying on the ground looking at the sky and asking questions like: Why is the sky blue? What are the clouds made of? Most adults stopped looking at the sky in that way a long time ago. I wanted to find a way to recapture that experience and share it with others. The project consists of two towers shaped to resemble grain silos. One is 28â tall while the other rises to a height of 20â. 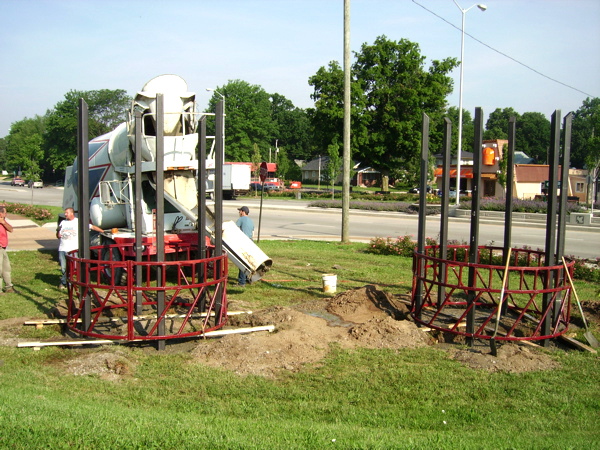 Two benches/lounges are placed under each silo. When laying on one of these the viewer is forced to look straight up through the silo, which has an opening at the top. The inside of the silo is lined with reflective aluminum. This reflective lining forces the eye to focus solely on the sky they see through the opening at the top. Without any outside visual reference the space between the top of the silo and the sky is non-existent. The color is very intense and feels very close to the outside surface. An more dramatic show occurs during dawn and dusk when the viewer can watch as the circle of color changes hue relatively quick. The goal is to give the viewer a brief reprieve from reality, to allow a loss of time and spatial relationships to occur and perhaps even trigger a memory of what it was like to be a child." The location of this project also plays an important role in its success. Jeff has chosen a space adjacent to the Indiana State Fairgrounds and right along the Monon Trail at 38th and Watson Rd. The Monon Trail, of course, is a popular city Greenway that once was a prominent railroad line transporting many things including grain and livestock to and through Indianapolis. Locating this project adjacent to the old rail line helps to emphasize the agricultural history of the State as well as speaks to the role that the railroad played in that development. In an effort to engage a large percentage of their employees in a major beautification project, Eli Lilly and Company has formed a partnership with Keep Indianapolis Beautiful to make a major impact on the city of Indianapolis. In the first year, Lilly expected to engage more than 8,000 volunteers in service. The date of the project coincides with the company's founding, which was May 10, 1876 and will celebrate their 132nd birthday. Their goal was team-oriented activity that makes a mark on the city of Indianapolis and gives their employees a greater sense of pride and engagement in their community. 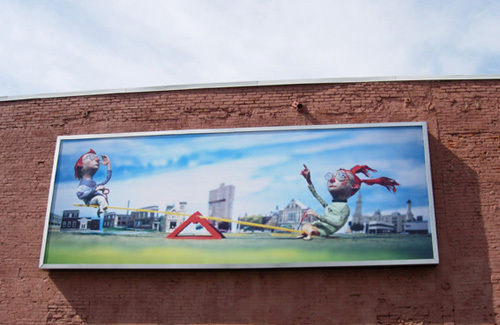 See-Saw, a new installation created by local artist and illustrator Chris Sickels, was installed in the Massachusetts Avenue light box near the intersection of College Avenue on October 2, 2007. Led by Public Art Indianapolis, the project consists of a high-resolution photograph of a mixed media sculpture/diorama, and measures 9 x 26 and features a twin brother and sister aboard a see saw. Public Art Indianapolis is managed by the Arts Council of Indianapolis and funded in part by the Indianapolis Cultural Development Commission. The light box was originally created as part of the Julian Opie: Signs public art exhibition, which ran from September 2006 to September 2007. Along with bringing newly created artwork to the area, the project also adds value to the initial investment in the light box by extending its use. The projects budget is approximately $2,500, and will be funded through the support of the Indianapolis Cultural Development Commission. The commissions funding is made possible solely through a grant from the Lilly Endowment, Inc.